Abe was primarily a studio musician and performed with a variety of orchestras backing many well-known artists and entertainers. Although known primarily for his "hot" jazz soloing style, Abe had a wide musical range as illustrated by this very beautiful solo on a 1951 Doris Day recording, "It's So Laughable." 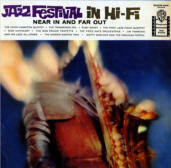 By contrast, here's Abe playing a hot solo on "Five Foot Two, Eyes of Blue," from Jazz Festival in Hi-Fi, a 1958 Warner Bros. compilation of bonus tracks from a variety of earlier Warner Bros. recording sessions. This particular track was recorded during a Matty Matlock and the Paducah Patrol session, but not included on the original vinyl album set. Abe's career dates back to the early days of recorded jazz. The following sound file is "Static Strut," recorded April 23, 1926 by the California Ramblers. Abe was less than a month past his 19th birthday at the time of this recording. Abe was an established member of many radio orchestras of the 1940's & 1950's that backed such radio dramas as Tales Of The Texas Rangers. 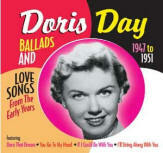 This show ran from July 8, 1950 to September 14, 1952 on the US NBC radio network. Wheaties was the primary sponsor of this show for most of its run. On the August 5, 1950 episode "Quick Silver," Abe was called upon to do a Wheaties commercial. 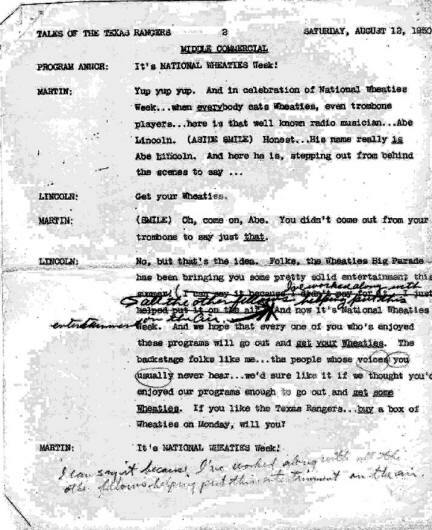 Below is an image of the actual page from the script Abe used during the show (August 12th episode date on script is wrong - reason unknown), along with a sound clip of the commercial itself.